My friends in New England… I’m so sorry. I know your winter has been a crappy one and full of so much more snow than normal. Down here in the South, we are getting our first blast of wintery weather. Now, we have had some seriously cold days (it was 11 degrees one morning last month) but we have had no ice or snow yet. That is about to change. We have some weather coming our way, and while it is really not going to hit my part of the state, it will hit the upper region and schools are being closed already. They may get an inch of snow, maybe…. but things are still closing. 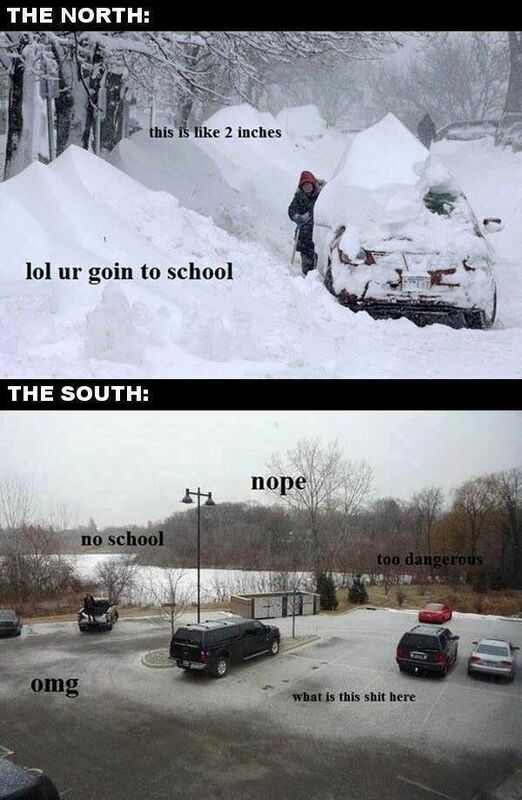 Because this is how southerners and northerners differ on winter weather…. Yup – Bimmer’s daycare closed early today and it was only raining when I picked her up! I will say that it is starting to ice now, but it all seems a little hilarious.